A home security system is nothing more than sensors that detect what's going on in and around your home, plus equipment connected to those sensors that lets you monitor them. The main sensors, of course, are motion detectors, cameras and microphones. And the equipment for monitoring these includes computers with monitors. It turns out that smart phones have all the electronics used in major security systems — both on the sensor side and the monitoring side. And phones are a lot cheaper than dedicated security systems. Plus, the best monitoring equipment is the one you have access to, and you always have access to your phone. That's why it's a great idea to integrate smart phones into your home security system. And it's also why small companies are inventing new ways to integrate phones into home security. Canary is a small, inexpensive device about the size of a soda can that's packed with sensors for monitoring a home. It contains not only the usual suspects — HD video camera, microphone and motion detector — but also sensors that detect room temperature, air quality and vibrations. It doesn't try to guess what's going on; it simply alerts you when anything changes suddenly. The makers of Canary claim that the gadget "learns your home's rhythms" and tells you when these are disrupted by anything unusual. Canary alerts you, of course, on your smart phone, through your home's Wi-Fi network. You get the alert whether you're home or on the other side of the world. You can connect as many phones as you like to the Canary by simply downloading an app and entering the the password you have set up. You can also set up notifications to alert others quickly from the Canary app or to set off the Canary's built-in siren. One advantage of something like Canary is that you can take it with you and monitor whatever home, apartment, hotel room or office you happen to be staying in. A free iPhone and Android app called Presence can be used for both sensing and monitoring. Use your old phone as the sensor and your current phone as the monitor. The Silicon Valley company that makes Presence, called People Power, has designed the app to be easy for anyone to use. 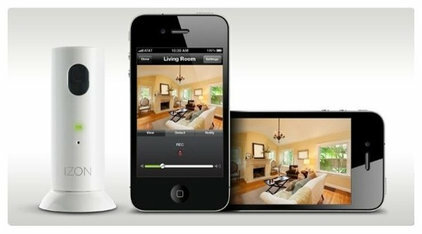 The sensor phone in your home detects motion and sends video of what triggered the alert to the phone you're carrying. Depending on how many old phones you have lying around, you could set up Presence-powered phones to look out the window at your driveway and front door, check out the backyard or monitor several rooms in the house. The iZon webcam is a tiny, cylindrical device that connects with a magnet to an included dome base, enabling you to turn it and tilt it for just the right view. 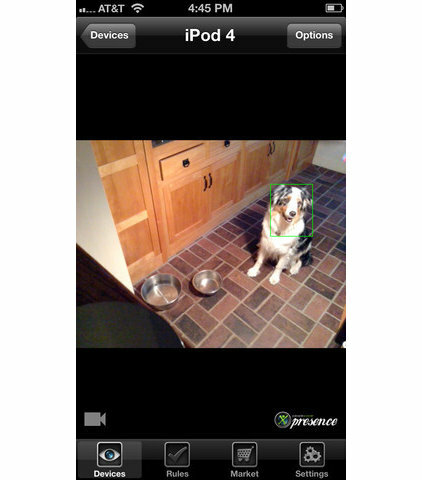 After installing the free iOS app, you can position and configure one or more iZon cameras. If you have more than one, you can move from one video feed to the next by tapping the screen. If you tap the Record button, you can capture up to 35 seconds of video at a time, which will be automatically uploaded to your YouTube account. The iZon can also be configured to auto record a video of the same length when it detects motion. You can even set it up to register motion only in a limited part of the field of view. This uploading-to-YouTube business is a great feature in case someone steals or destroys the camera itself — the evidence is in your control. The fact that home security systems can be too expensive or complex is no longer a good excuse to leave your home unprotected. With the right products, including the right smart phone, you can put together a functional, affordable home security system.